Fashion Forward or Selling Black Culture for Tweens? Hip-Hop has been commercialized for years now. There’s no denying that. Your parents or grandparents probably know a few Biggie or Tupac lyrics, or at least are aware of who they are. The know Jay-Z as the rapper and the business man. They know that people couldn’t stop talking about Kendrick Lamar’s verses on Control. Like any other genre of music, portions of Hip-Hop is mainstream cool. People have been complaining that hip-hop has been completely white-washed. Thanks to the popularity of rappers like Macklemore and Iggy Azalea. However you feel about them, you can’t deny the fact that in mainstream pop music they have become the faces of new hip-hop. Easily digestible for people who may not have been raised on rap and hip-hop culture. They also have crossover appeal because of their whiteness. As someone who listens to all kinds of music, I find it refereeing to know other people who a diverse taste as well. This summer I went to an old school hip-hop show and was surrounded by a bunch of white fans who were rapping along to the MC’s like Big Daddy Kane and Naughty by Nature. Hip-hop has become universal and there’s nothing wrong with that. However my biggest problem with Forever 21’s N.W.A shirts is because of lack of knowledge of what the words and faces on those shirts mean. For one, N.W.A stands for Niggaz Wit Attitudes. N.W.A was popular rap group that rose in the late 80s in Compton, California. They were considered the pioneers of gangsta rap on the west coast. Their music, heavily criticized at the time for being violent, disrespectful to women, glorifying drugs and other criminal like behavior. However it was also a response to what was happening around them at the time. Drugs, crime, poverty, and violence was what consisted for people living in urban areas. They were able to take what was going on at the time and talk about it on a worldwide stage. Folks who lived in urban areas all over the the nation was able to relate. This is at it’s core what made N.W.A great and want makes them a legendary group in hip-hop. So why can’t pretty young blonde girls not wear a N.W.A shirt? The majority of buyers at Forever 21 probably know nothing about N.W.A. The fact that the website’s models are conventionally pretty, skinny, blonde, white girls who are wearing these shirts seems ironic. A group that almost 20 years ago who would have never cater to this audience is now being sold at a store where 13-18 year old girls could spend all of their allowance. I wonder what was going through the heads of the designers at Forever 21: How can we sale edginess and Miley Cyrus to our preteen set? Hip-Hop and Black Culture will always be discussed and dissected. Because it’s not created in a vacuum, black people aren’t the only ones who will appreciate it. However how can we distinguish between appreciate or appropriation? 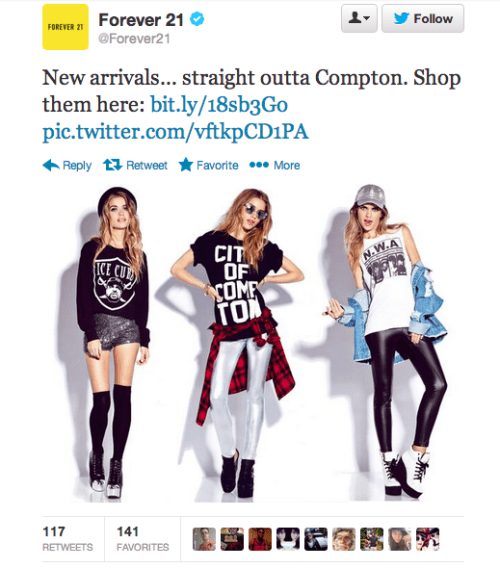 What do you guys think, do you believe Forever 21 was right for having white models wear N.W.A shirts or do you think that they should of used black models? Or do you think they should have never made the shirts in the first place? Oh wow. I’ll have to come back to this post! Thanks for sharing!